Back Row: John Giannios, Gary Andrews, Phil Howren, Steve Foster, Ed Costello, Larry Hageman, Ron Delans, Marty Cohen, Doug Finnie. 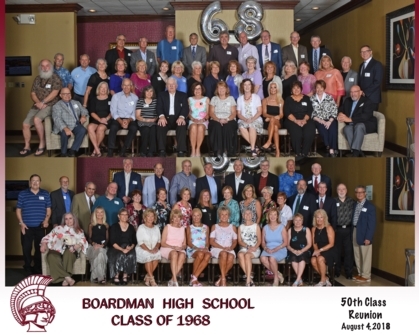 Middle Row: Bill Eberhart, Bill Hrinko, Jim Forestal, Linda Cappy Hite, Karen Hartenstein Kannal, Linda Cutton Davidson, Emily Evans Slaven, Patti Grant Yocum, Nancy Hofmaster Nagy, Mary Lou Atwood Scott, Lynn Garver Shipe, Barbara Brock Rauschenberg, Jo Ann Clemente York, Aliene Claycomb Moulin, Cassie Baughman, Joy Fleming, Greg Hartz, Roy Bieber. Front Row: Chris Chengelis, Dianne Geller Andrews, Dennis Hodge, Shari Creed McConnell, Brian Crowley, Merceda Berkos Saleman, Sue Bierdeman Armstrong, Janet Camp Riccardi, Deanna Frum Brannigan, Paula Bruno Shields, Gretchen Hoffman Julian, Ira Hermann. Back Row: Larry Wire, Ben Post, Jim Oesch, John Ryan, Robert Meredith, Harry Macaulay, Roger Kreps, Rick Morgan. Middle Row: Dave West, Fred Yosua, Mark Mangie, Larry Wire, Linda Reynallt Taylor, Joan Sherfel, Hilary Soller, Paula Mead Finnie, Edie Small Davidson, Karen Powell Davis, Sandy MacDonald Goddard, Patty Thompson Flower, Jim Kessler, Lou Kreider, Dave Taylor, Rick Mastriana. Front row: Michelle Silver, Glori (Tess) Schotland Wilkoff, Louann Lauer, Marilyn Lenefonte Hammerton, Maryann Martin Costello, Vicky Mansfield Italiano, Micki Mansfield Ryan, Carol Keppler Hawkins, Sharon Prizant Blumental, Carol Wolverton Salmon, Marilyn Miller Weaver.